Here, we show the generation of human engineered heart tissue from induced pluripotent stem cells (hiPSC)-derived cardiomyocytes. We present a method to analyze contraction force and exemplary alteration of contraction pattern by the hERG channel inhibitor E-4031. This method shows high level of robustness and suitability for cardiac drug screening. Mannhardt, I., Saleem, U., Benzin, A., Schulze, T., Klampe, B., Eschenhagen, T., Hansen, A. Automated Contraction Analysis of Human Engineered Heart Tissue for Cardiac Drug Safety Screening. J. Vis. Exp. (122), e55461, doi:10.3791/55461 (2017). Cardiac tissue engineering describes techniques to constitute three dimensional force-generating engineered tissues. For the implementation of these procedures in basic research and preclinical drug development, it is important to develop protocols for automated generation and analysis under standardized conditions. Here, we present a technique to generate engineered heart tissue (EHT) from cardiomyocytes of different species (rat, mouse, human). The technique relies on the assembly of a fibrin-gel containing dissociated cardiomyocytes between elastic polydimethylsiloxane (PDMS) posts in a 24-well format. Three-dimensional, force-generating EHTs constitute within two weeks after casting. This procedure allows for the generation of several hundred EHTs per week and is technically limited only by the availability of cardiomyocytes (0.4-1.0 x 106/EHT). Evaluation of auxotonic muscle contractions is performed in a modified incubation chamber with a mechanical interlock for 24-well plates and a camera placed on top of this chamber. A software controls a camera moved on an XYZ axis system to each EHT. EHT contractions are detected by an automated figure recognition algorithm, and force is calculated based on shortening of the EHT and the elastic propensity and geometry of the PDMS posts. This procedure allows for automated analysis of high numbers of EHT under standardized and sterile conditions. The reliable detection of drug effects on cardiomyocyte contraction is crucial for cardiac drug development and safety pharmacology. 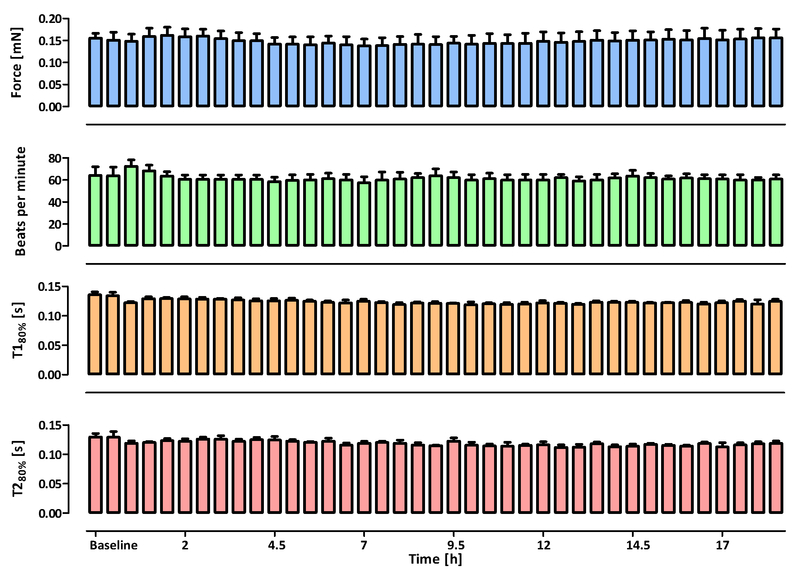 We demonstrate, with the example of the hERG channel inhibitor E-4031, that the human EHT system replicates drug responses on contraction kinetics of the human heart, indicating it to be a promising tool for cardiac drug safety screening. Cardiac side effects such as the drug-induced long QT syndrome have led to market withdrawals over the past years. Statistics indicate that about 45% of all withdrawals are due to unwanted effects on the cardiovascular system1. This drug failure after the expensive developmental process and approval is the worst-case scenario for pharmaceutical companies. Research and development departments therefore focus on detection of such unwanted cardiovascular effects early on. For economic and ethical concerns, efforts to reduce animal experiments and replace them with new in vitro screening assays are ongoing. A set of established assays are included in the United States Food and Drug Administration (FDA) and European Medicines Agency (EMA) guidelines for preclinical evaluation of proarrhythmic drug effects2. The technology of reprogramming somatic cells followed by differentiation of human induced pluripotent stem cells (hiPSC) boosted this research field3. It now offers the possibility to screen new drug candidates on human cardiomyocytes in vitro and avoids issues with inter-species differences. Recent cardiac differentiation protocols4,5 provide unlimited supply of cardiomyocytes without ethical concern. However, the measurement of contractile force, the most important and best characterized in vivo parameter of cardiomyocytes, is not well established. This is related to the relative immaturity6 of human induced pluripotent stem cell-derived cardiomyocytes (hiPSC-CM) as compared to the adult cardiomyocyte. A possible advancement is to engineer 3-dimensional heart tissue from single cells7 (engineered heart tissue, EHT). The EHT protocol is based on embedding single murine or human cardiomyocytes8,9,10 in fibrin hydrogel between two flexible polydimethylsiloxane (PDMS) posts11 in 24-well format. Within a few days the cardiomyocytes start to contract spontaneously as single cells and start to form cellular networks. After 7-10 days, macroscopic contractions of the entire tissue are visible. During this process the extracellular matrix is remodeled, which leads to a decrease of diameter and length. The shortening of the EHT results in bending of the PDMS post even during rest, subjecting cardiomyocytes in the developing EHT to continuous load. EHTs continue to perform auxotonic muscle contractions over several weeks. Human EHTs show responses to physiological and pharmacological stimulation indicating their suitability for drug screening and disease modeling7. 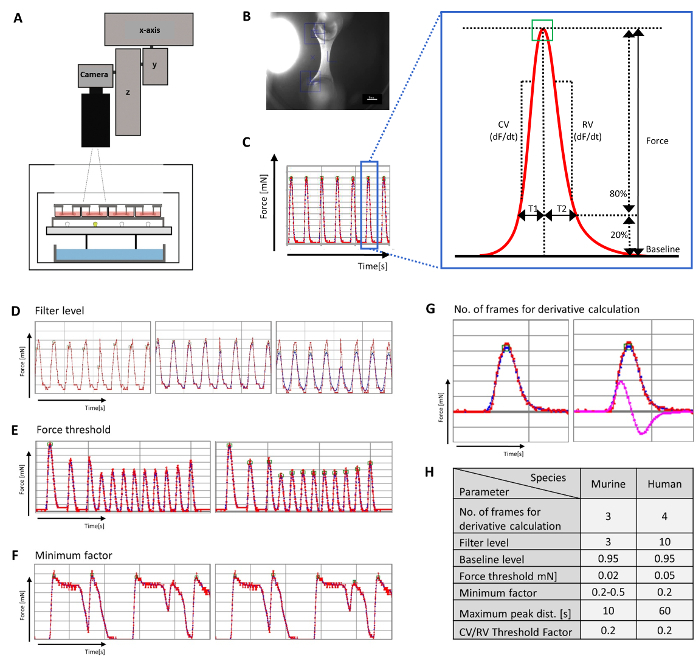 In this manuscript we present a robust and easy protocol for the generation of human EHT, and the automated contractility analysis of concentration dependent changes of the contraction pattern in the presence of hERG channel inhibitors. NOTE: The following steps describe a cell culture protocol. Please perform under sterile conditions and use pre-warmed media. Coat 6-well plates (1 mL/well) or T75 flasks (7 mL/flask) with reduced growth factor basement membrane matrix (e.g. geltrex, 1:200; see table of materials) diluted in Dulbecco's modified Eagle medium (DMEM) for 30 min at 37 °C. Prepare FTDA medium12 by mixing basic DMEM/F-12 medium with 2 mM L-Glutamine, 0.5% penicillin/streptomycin, 5 mg/L transferrin, 5 µg/L selenium, 0.1% human serum albumin, 1x lipid-mix, 5 mg/L insulin, 50 nM dorsomorphin, 2.5 ng/mL activin A, 0.5 ng/mL human TGFß1 and 30 ng/mL FGF2. Seed hiPSC (~3 x 105/ 10 cm²) in FTDA medium and culture at 37 °C, 5% CO2, 21% O2 with daily medium change (Figure 1A). At 80% confluency, passage (1:2-1:6) with ethylene diamine tetraacetic acid (EDTA; 0.5 mM; incubation time ~4 min). Cultivate hiPSC in T75 flasks to high density. Wash flasks with confluent cells twice with phosphate buffered saline without calcium and magnesium (PBS) and incubate in 0.5 mM EDTA for ~10 min. Make sure the cells do not detach from the bottom of the flask. Remove EDTA with glass pipette, flush off cells with 10 mL PBS, tap flasks at the bench to detach cells. NOTE: Use cell scraper if necessary. Collect cells in 50 mL conical tube, add ¼ of volume (e.g. 10 mL RMPI to 40 mL cell suspension) RPMI 1640 medium (or any other standard medium containing 1.8 mM calcium) and centrifuge at 250 x g for 5 min. Resuspend cell pellet in FTDA medium supplemented with 4 mg/mL polyvinyl alcohol (PVA) and 10 µM Y27632 and count the cells in a Neubauer chamber. Fill the spinner flask with the cell suspension (30 x 106 cells/100 mL FTDA medium supplemented with PVA and Y-27632; see step 1.2.2) and initiate EB formation in spinner flasks (adjust rotor speed of magnetic stirrer to 40 rpm) in the cell culture incubator (37 °C, 5% CO2, 5% O2) over night. During EB formation, coat cell culture flasks suitable for suspension culture with non-ionic surfactant (14 mL/T175) over night at 37 °C. The next morning, wash surfactant-coated flasks twice with PBS (30 mL/T175). Add PBS again and keep in the incubator until needed. Remove the spinner flask from the incubator. NOTE: Cell suspension should be clear with small macroscopically visible EBs (Figure 1B). Transfer 50 mL suspension to a 50 mL conical tube and let EBs settle for 5-20 min. Remove the supernatant and wash the pellet with 7 mL of RPMI 1640 supplemented with 2% PVA and 10 µM Y-27632. Transfer suspension to a graduated 15 mL conical tube and estimate EB volume (~50-100 µL). Transfer contents of the spinner flasks to uncoated T175 flasks and leave this on V-shaped rack for sedimentation for up to 20 min. Remove supernatant and wash embryoid bodies as stated above. Do not fill the T175 flask with more than 200 mL as sedimentation would take too long. If initial spinner flask volume exceeds 200 mL, split EB suspension to several T175 flasks and combine EBs again after washing. Remove washing medium and resuspend in medium for mesodermal differentiation, that is RPMI supplemented with 4 mg/mL PVA, 0.5% penicillin/streptomycin, 10 mM 4-(2-hydroxyethyl)-1-piperazineethanesulfonic acid (HEPES), 0.05% human serum albumin, 5 µg/mL transferrin, 5 ng/mL sodium selenite, 0.1% lipid mix, 250 µM phospho-ascorbate, 10 µM Y-27632, 10 ng/mL bone morphogenic protein-4 (BMP-4), and 3 ng/mL activin A, 5 ng/mL stable FGF2. Remove PBS from surfactant-coated T175 flasks and fill with cell suspension (200 µL EBs in 40 mL). Use smaller flasks for smaller EB volume. Cultivate EBs in suspension for three days (37 °C, 5% CO2, 5% O2). Exchange 50% of the medium (same composition as in step 1.3.7) every day (use V-shaped sedimentation rack). Prepare medium fresh every day prior to feeding. Prepare new surfactant-coated vessels the day before and handle as stated above (1.3.2). After three days of mesodermal induction, let EBs settle for up to 5 min on sedimentation rack. Remove most of the medium and wash with RPMI 1640 supplemented with 0.5% penicillin/streptomycin and 10 mM HEPES. Transfer 10 mL of EB suspension to graduated 15 mL tube and estimate EB volume after sedimentation. Resuspend EBs carefully in cardiac differentiation medium consisting of RPMI 1640 supplemented with 0.5% penicillin/streptomycin, 10 mM HEPES, 0.05% human serum albumin, 5 µg/mL transferrin, 5 ng/mL sodium selenite, 0.1% lipid mix, 250 µM phospho-ascorbate, 1 µM Y-27632, 100 nM Wnt-inhibitor DS-I-713. Transfer EBs to new surfactant-coated cell culture flasks (~200 µL EBs in 46 mL/T175). Incubate for three days (37 °C, 5% CO2, 21% O2) with 50% medium change (medium composition see step 1.4.4) on the second and third day. Do not change the medium within the first 48 h.
Incubate in medium consisting of RPMI 1640 supplemented with 500 µM 1-Thioglycerol, 10 mM HEPES, 0.5% penicillin/streptomycin, 1 µM Y-27632, 2% serum-free neural cell culture supplement (e.g. B27) with insulin, 100 nM Wnt-inhibitor DS-I-7 with daily exchange of 50% medium for the next four days. EBs should start beating within this period. After one week of cardiac differentiation, switch to the same medium without Wnt inhibition and with serum-free neural cell culture supplement. Change 50% of the medium every day, except for the first day. NOTE: After two weeks of differentiation protocol, EBs should show spontaneous contractions (Figure 1C). If so, start dissociation and prepare collagenase solution. Prepare collagenase solution by weighing and solving 200 U/mL in calcium-free Hanks' balanced salt solution without calcium/magnesium (HBSS) and add 1 mM HEPES, 10 µM Y-27632, 30 µM N-benzyl-p-toluene sulphonamide (BTS). Sterilize by filtering (0.2-µm filter) and store aliquots at -20 °C. Thaw aliquots at 4 °C over night. Settle EBs on sedimentation rack, aspirate medium and replace with 20-25 mL pre-warmed HBSS. Repeat this washing step once more. Aspirate HBSS and replace with pre-warmed collagenase solution (15 mL/T175). Incubate for 4 h in the cell culture incubator (37 °C, 5% CO2, 21% O2). Prepare blocking buffer with DMEM supplemented with 1% penicillin/streptomycin and DNase (12 µg/mL). Tap the cell culture flasks on the bench, dissociated EBs should disintegrate and fall apart (if not, increase incubation time). Gently triturate cell suspension and transfer to a conical 50 mL tube. Wash flasks with blocking buffer (15 mL/T175) and transfer to tube. Centrifuge for 10 min at 100 x g. Resuspend cells in warm DMEM, triturate and count cells. Autoclave commercially available PDMS racks and polytetrafluorethylene (PTFE) spacers (see Materials and Equipment spreadsheet; Figure 2) and prepare the following solutions under sterile conditions, one day prior to EHT generation. Prepare 2% agarose by weighing and dissolving in appropriate volume of PBS, autoclave, immediately store at 60 °C. Prepare aprotinin (33 mg/mL) by weighing and dissolving in appropriate volume of aqua ad iniectabilia, filter sterile (0.22-µm filter), aliquot and store at -20 °C. Prepare fibrinogen (200 mg/mL) by dissolving sterile fibrinogen in appropriate volume of sterile 0.9% NaCl (lukewarm), aliquot and store at -20 °C. Prepare thrombin (100 U/mL) by dissolving sterile thrombin in three parts sterile PBS and 2 parts aqua ad iniectabilia, aliquot portions of 3 µL in small tubes and store at -20 °C. Prepare 10x DMEM by dissolving 670 mg 10x DMEM powder in 5 mL aqua ad iniectabilia, filter sterile and store at 4 °C. Prepare 2x DMEM by mixing 2 mL 10x DMEM with 2 mL heat-inactivated horse serum, 0.2 mL penicillin/streptomycin and 5.8 mL aqua ad iniectabilia, filter sterile and store at 4 °C. Prepare EHT-casting medium (ECM) by mixing DMEM with 10% heat-inactivated fetal calf serum, 1% penicillin/streptomycin and 1% L-glutamine (200 mM), store at 4 °C. Prepare casting molds in 24-well plates by pipetting 1.6 mL warm agarose (2%, PBS) and placing the PTFE spacer (Figure 2A) into the wells. NOTE: Place spacer immediately after pipetting into a maximum of 8 wells - agarose solidifies very fast. Do not leave the agarose at room temperature for longer than 5 min. After agarose solidification (~10 min, agarose will turn opaque), remove the PTFE spacers (Figure 2C) and place the PDMS racks (Figure 2B) into the casting molds so that pairs of PDMS posts reach into each mold (Figure 2D). Resuspend the cardiomyocytes in ECM with a minimum concentration of 15 x 106 cells/mL. Prepare 110% of the estimated volume of reconstitution mix in a round bottom 15-mL tube on ice.For 24 EHTs, pipette the reconstitution mix listed in Table 1 for human, rat or mouse cardiomyocytes, respectively (10% extra is included). NOTE: Cell concentration of the reconstitution mix is different for human (10 x 106 cells/mL), rat (4.1 x 106 cells/mL) and mouse (6.8 x 106 cells/mL) EHTs. Depending on the concentration of the cell suspension, add additional ECM to a final volume of 2,640 µL. Fibrinogen has to be lukewarm for pipetting. Slowly fill the tip of the pipet and do not touch the surface of the cold reconstitution mix with the fibrinogen-containing pipet when adding fibrinogen to the reconstitution mix - the viscosity of the fibrinogen in the pipette tip would increase immediately. Triturate the reconstitution mix 10 - 15 times with a serological pipette until the fibrinogen clot is dissolved. Check the reconstitution mix in the pipette for homogeneity. For each EHT, pipet 100 µL reconstitution mix in one thrombin aliquot (3 µL in 200 µL tube), mix and pipet the mixture into the agarose-slots as quickly as possible (Figure 2E). Use a new filter tip for each EHT. Resuspend the reconstitution mix (trituration with serological pipette 5-10 times) after every 8 EHTs. Once all slots are filled with reconstitution mix, close the lid of the cell culture dish and incubate at 37 °C, 7% CO2 for 2 h.
Remove the plate from the incubator and place under a sterile hood. Cover each well with a small amount of medium (e.g. DMEM, approximately 200 - 500 µL), shake the plate gently and incubate again at 37 °C for at least 10 min. The addition of DMEM will ease the removal from fibrin gels from agarose casting molds. Prepare a new 24-well plate with 1.5 mL EHT-medium per well consisting of DMEM supplemented with 10% heat-inactivated horse serum, 1% penicillin/streptomycin, 10 µg/mL insulin, 33 µg/mL aprotinin. Carefully remove the PDMS racks from the agarose casting molds and transfer them to the medium-filled 24-well plate (Figure 2F). Place the dish back in the incubator (37 °C, 7% CO2, 40% O2 for human and rat EHTs, 21% O2 for mouse EHTs) and feed Mondays, Wednesdays and Fridays with freshly prepared EHT-medium. EHTs should show spontaneous contractions deflecting the posts of the PDMS racks 7-10 days after casting (Figure 1D, 2G). For mouse EHTs add 25 µg/mL of 5-cytosine βDarabinofuranoside to culture medium for 48 h to limit fibroblast proliferation. NOTE: The contraction analysis is based on video-optical recording in a commercially available EHT analysis instrument (see Table of materials). The central unit of this instrument is an incubation chamber (Figure 3A). The software provided with the instrument calculates contraction force based on deflection of the PDMS posts with known elastic modulus and geometry11 (Supplementary Figure 1). Turn on the heating device of the machine 2 h prior to the measurement. Turn on gas supply and electronic supply of the axis system immediately prior to the contraction analysis. For baseline recording (reference point in the analysis), place the 24-well-plate with the EHTs in EHT-medium into the EHT analysis instrument and start the contraction analysis software according to supplier manual. Click the "Protocol" tab on the right panel and enter relevant information regarding study name, user, species, cell type, age, recording length and additional remarks. Click the "Camera view" tab on the left panel and start camera live mode with automatic figure detection mode. Click the "Setup" tab on the right panel andadjust the camera position with the xyz coordinates for each well in the 24-well-dish. Make sure the EHT is in the center of the window and in focus of the camera. Make sure the lid of the cell culture dish is not foggy as this will impair figure recognition and contraction analysis. NOTE: The figure recognition algorithm is based on detecting high contrast areas and monitoring their change in position. In the software these areas of figure recognition will be marked with a blue cross that moves with the contractions of the EHT. Make sure that the positions of the blue crosses are at both the top and bottom ends of the EHTs and moving only vertically matching the contractions of the EHTs (Figure 3B). Save setup positions of each well by pressing the button "position ok". Next, click the "Parameters" tab on the left panel. The parameters displayed here define the criteria by which the software identifies a contraction peak and marks it with a green square. These values are very important for correct identification of contraction peaks (Figure 3C) and no false data points (Figure 3E-F). NOTE: A list of species dependent parameters and examples is depicted in Figure 3H. For further details, please consult the software manual. Click the "Automatic" tab on the right panel and initiate the analysis by activating the "Start" button. The software will move sequentially from one well to the next, record EHT contractions and calculate force during recording (displayed in the "Real time" tab on the left panel). At the end of the analysis, a pdf report summarizing the results will be generated automatically. Save and analyze the pdf report the system generated to summarize the results. Monitor the contractile parameters by repeated measurement over several days. The EHT will increase in contraction force until it has reached a plateau (usually around day 15 of culture). Prepare protein free Tyrode solution one day prior to measurement and equilibrate in 24-well plates (2 mL/well) in the cell culture incubator (37 °C, 7% CO2, 40% O2) over night: 120 mM NaCl, 5.4 mM KCl, 1 mM MgCl2, 0.1-5 mM CaCl2, 0.4 mM NaH2PO4, 22.6 mM NaHCO3, 5 mM glucose, 0.05 mM Na2EDTA, 25 mM HEPES. Add calcium up to 1.8 mM or the previously determined [EC50] to investigate positive inotropic effects. Weigh and dissolve the drug in DMSO and filter sterile, if necessary. Prepare 6 different 1000x-sub-stock solutions (in DMSO) of the working concentration (e.g. 0.3, 1, 3, 10, 30, 100 µM for the respective nanomolar range). Dilute the respective stock in the Tyrode plates (2 µL in each 2 mL well) and mix thoroughly. Place the plates back in the incubator until needed. Start the baseline measurement by taking the first Tyrode-filled 24-well-plate under the sterile hood and position carbon electrodes in the wells. Transfer the PDMS racks with the EHTs placed on top of carbon electrodes, close the lid, put the plate back in the incubator and wait for an equilibration period of ~ 30 min. Transfer the EHTs from the incubator to the interlock in the EHT analysis instrument. Close the instrument and record spontaneous baseline contractility (20 s/EHT). Connect the carbon electrodes to the pacing cable and start electrical stimulation of the EHTs (2.5 V, 4 ms impulse duration, human: ~1 Hz, rat: ~2 Hz, mouse: ~4 Hz). Record the "paced" baseline (10 s/EHT). Ensure that all EHTs are properly paced. Stimulation frequency and voltage might vary from cell line to cell line. After baseline recording, remove the EHTs from the instrument and transfer the electrodes with the PDMS racks on top, to the 24-well-plate with the first drug concentration. Transfer the EHTs back onto the interlock of the EHT analysis instrument immediately and incubate there (standard drug incubation time e.g. 20 min). Reconnect pacing cables, adjust figure recognition and record EHT contractions responding to the first drug concentration. For the following drug concentrations, repeat step 3.5.7 and 3.5.8 with the 24-well-plates containing higher drug concentrations. Save all pdf recordings. Check each recording for figure recognition, correct positioning of green squares identifying contraction peaks and artifacts (see 3.2.1 and Figure 3). Perform additional offline analysis if needed. Choose the respective run from the "Runs" database on the left panel by clicking "Select run". In the "Parameter" tab on the left, change parameter for contraction analysis. Now choose "Offline analysis" in the "Offline" tab on the right panel to reanalyze the videos. To adjust figure recognition and therefore record a new video file, choose "Sample review" after adjusting the figure recognition in the "Real time" tab. NOTE: Sample review can only reanalyze one well at a time, whereas offline analysis can apply new parameter for all wells by clicking the button "Use parameter on all wells" in the "Parameter" panel on the left. Both types of offline analyzes will automatically create new data files and pdf displaying the results. 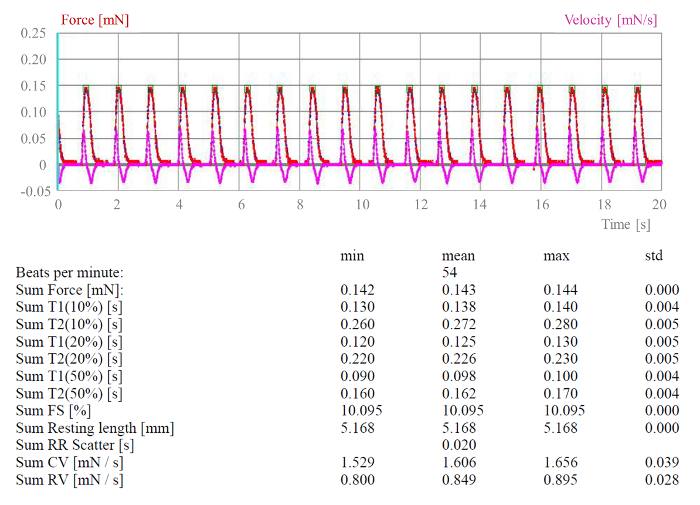 Analyze the experiment by combining the results of the biological replicates and summarize the data in concentration response curves for frequency, contraction force, contraction time and relaxation time (Figure 5D) and/or graphical display of average contraction peaks (Figure 5C). NOTE: PDMS racks and PTFE spacer can be used repeatedly (PDMS racks max. 5 times, and PTFE spacer endlessly). After use, clean them manually with water, boil twice in demineralized water and autoclave. Be aware of potential carry-over effects, when re-using the racks, as drugs might be absorbed by the PDMS. HiPSC were expanded on reduced growth factor basement membrane matrix, dissociated with EDTA and embryoid bodies (EBs) formed in spinner flasks overnight. After mesodermal induction for three days, cardiac differentiation was initiated with the Wnt inhibitor. After ~17 days of differentiation protocol, beating EBs were dissociated into single cells with collagenase type II (Figure 1). EHTs were prepared from freshly isolated cardiomyocytes with 1.0 x 106 cells per 100 µL tissue immediately after EB dissociation (Figure 2). For preparation from frozen cells (e.g. commercial suppliers), cells were thawed by drop-wise resuspension in medium and resuspended in ECM after centrifugation. Within 48 h, spontaneous beating of single cells was observed microscopically in the EHT. Over the next days, cardiomyocytes spread out longitudinally along the force lines of the tissue, coupled and formed a coherently beating EHT. The macroscopically visible deflections of the PDMS posts were measured with the EHT analysis instrument. Analysis of EHT contractility was based on video-optical recording (Figure 3). Within the system, the 24-well plate with EHTs was positioned in the gas- and temperature-controlled incubator chamber with a glass roof. A camera connected to a motorized XYZ-axis was positioned above this unit, and XYZ-coordinates were defined for each EHT with a software program. Analysis of each EHT was based on figure recognition at the top and bottom ends of the tissue. An automated software algorithm analyzed the filmed EHT contractions and calculated force development based on post deflection and elasticity/geometry of the PDMS posts (Supplementary Figure 1)11. After determination of peaks according to predefined criteria, a pdf report summarized parameters of contractility for all EHTs (Supplementary Figure 2). Long term measurement of EHTs was performed in the continuous mode with automated repeated measurement every 20 min. Contraction analysis showed no time-dependent changes (Post test for linear trend was not significant) in contraction force, beating frequency, contraction time T1 or relaxation time T2 for up to 20 h, indicating a high level of stability (Figure 4). As with every biological sample though, the EHTs show some level of variability, as expected for biological replicates. The variation coefficients at beginning and end of long term measurement were 7/13% for force, 12/6% for frequency, 4/3% for contraction time and 4/3% for relaxation time, respectively (n = 4). This variability between biological replicates is not an artifact of figure recognition or analysis as the results for each single EHT are reproducible and have low variability (Supplementary Figure 2). Drug screening was performed in serum-free Tyrode's solution. Cumulative concentration response curves were generated with a maximum DMSO vehicle concentration of 0.1%. Baseline contraction analysis showed very little irregularity in beating pattern and very low variability between the replicates. Exposure to the hERG channel blocker E4031 resulted in a significant prolongation of the relaxation time (T2) at 10 nM and irregular beating pattern at higher concentrations (Figure 5). For frequency controlled contraction analysis, measurements were optionally performed with electrical stimulation using carbon electrodes. Figure 1: Cardiac differentiation. (A) Human induced pluripotent stem cells. Scale bar = 100 µm. (B) Embryoid bodies at the beginning of mesodermal differentiation. Scale bar = 100 µm. (C) Contracting embryoid bodies at the end of cardiac differentiation. Scale bar = 100 µm. (D) Human engineered heart tissue. Scale bar = 1 mm. Please click here to view a larger version of this figure. Figure 2: Generation of Engineered Heart Tissue (EHT). (A) PTFE spacer. (B) PDMS rack. A, (B) Scale bar = 1 cm (C) Top view on a well of a 24-well-plate with casting mold in agarose after removal of the PTFE spacer. (D) Pair of posts from the PDMS rack positioned in the casting mold. (E) Reconstitution mix pipetted into the casting mold and around the PDMS posts. (F) Freshly generated EHT at day 0, transferred to a new culture dish with medium. (G) Remodeled EHT in medium at day 15. Please click here to view a larger version of this figure. Figure 3: Contraction Analysis of Engineered Heart Tissue (EHT). (A) EHT analysis instrument with computer-controlled camera above the gas- and temperature-controlled incubation chamber with EHTs in 24-well-culture dish on top of a LED panel. (B) Live view of an EHT during analysis with the automated contraction analysis software. (C) Exemplary contraction pattern displaying contraction force over time measured with 100 frames per second and enlarged schematic contraction peak, displaying the analysis parameter force, contraction time (T1), relaxation time (T2), contraction velocity (CV), relaxation velocity (RV; this figure has been reprinted from7 and27). D-H: Parameters for contraction analysis. (D) Examples of different filter levels (blue filtered line) affecting the figure recognition. Left: Filter level = 0. Note that no blue filtered line is visible, but only the red original trace. Middle: Filter level = 3, indicating ideal recognition/analysis of the contraction peaks. Right: Filter level = 20. Note that the blue filtered lines are much smaller than the original traces indicating poor contraction peak analysis. (E) Example of arrhythmic EHT contractions analyzed with a too high force threshold (left) and lower force threshold (right) with all peaks recognized. (F) Examples traces of EHTs exposed to the sodium channel agonist ATX-II resulting in a prolonged relaxation time with early after contractions. Note that the fourth contraction peak on the left panel is not recognized (no green square) due to a too low minimum factor. (G) Examples of contraction peaks with (right panel) and without (right panel) pink curve (first derivative of contraction curve, contraction and relaxation velocity). (H) Summary of parameter recommendations for murine and human EHTs. Note that these parameters might need adjustment as contraction pattern changes during drug exposure (see E, F). Please click here to view a larger version of this figure. Figure 4: Time Control During Long Term Measurement of Spontaneously Beating Human Engineered Heart Tissue (EHT). Time control during long term measurement of spontaneously beating human engineered heart tissue (EHT). EHTs were positioned in the EHT analysis instrument and incubated for a period of 20 h. Automated contraction analyses were performed every 20 min with not significant post-test for linear trend (n = 4; data represent mean + standard deviation). Please click here to view a larger version of this figure. Figure 5: Effect of hERG Channel Blocker E4031 on Human Engineered Heart Tissue (EHT). (A) Exemplary contraction pattern at baseline. (B) Exemplary contraction pattern after incubation in 300 nM E4031. (C) Average contraction peak (n = 4) of electrically stimulated EHTs at baseline (black) and after 30 min incubation in 100 nM E4031 (red). Analysis with 100 frames per second. (D) Concentration response curves for E4031 on spontaneously beating human EHTs. Note the smaller effect size in T2 prolongation in the electrically stimulated EHTs (C) vs. the spontaneously beating EHTs (D). One-way ANOVA, repeated measures with Dunnett's post-test vs. baseline; * p <0.05; n= 4. Z' factor25 for T2 prolongation at 300 nM E4031 is 0.75. Please click here to view a larger version of this figure. Table 1: Pipetting Scheme for Preparation of Reconstitution Mix for 24 Human, Rat and Mouse EHTs. Fibrinogen concentration is 5 mg/mL for all EHTs. Note that cell concentration is different for each species. For human EHTs, add basement membrane matrix (e.g. matrigel, see Materials Table) and Rho-kinase inhibitor Y-27632 to the mixture. For mouse EHTs, add basement membrane matrix. Depending on the initial concentration of the cell suspension, add additional ECM to reach a total volume of 2,640 µL reconstitution mix. Supplementary Figure 1: Calculation Formula for Contraction Force Based on Post Deflection26. Please click here to view a larger version of this figure. Supplementary Figure 2: Exemplary Data Excerpt from the Contraction Analysis Report of the Software. Top: Contraction peaks over 20 s of time recorded with 100 frames/s (red: contraction force; pink: contraction velocity). Bottom: Analyzed contraction parameter showing minimum, mean, maximum value and standard deviation of the 18 analyzed contraction peaks marked with a green square (top). Please click here to view a larger version of this figure. 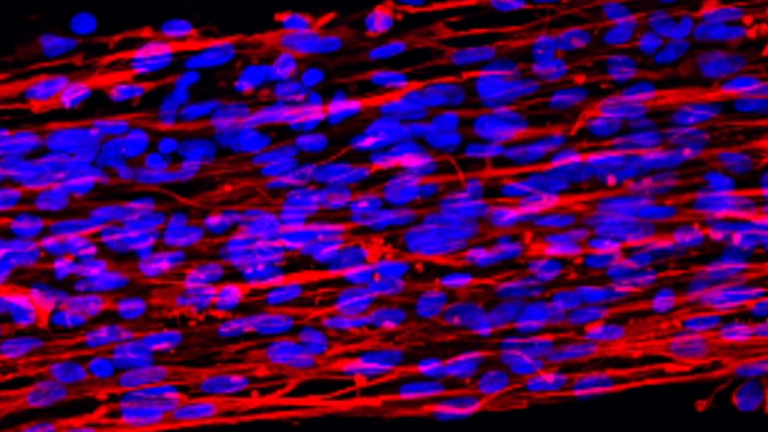 Engineered heart tissue offers a valuable option to the tool box of cardiovascular research. EHTs in the 24-well format have proven valuable for disease modeling8,14, drug safety screening7,8,10,11,15, or basic cardiovascular research16,17. Potential modifications of the basic EHT protocols include studies on cellular interaction with defined mixtures of cardiomyocytes and non-cardiomyocytes18 and afterload enhancement14. Important aspects for troubleshooting include the quality of the input cell population and the quality of fibrinogen. If the initial gel formation is irregular or not compact enough to stick to PDMS posts, or if the gel is rapidly degenerated within a few days after casting due to low aprotinin concentration, EHTs generation will not be successful. The following limitations have to be considered. (i) The throughput in 24-well format is not well suited for a primary screening setup, but is sufficient for a secondary confirmation screen. (ii) The integrated readout of force, contraction kinetics and rhythm have low specificity, which makes it difficult to link changes in force to specific molecular mechanisms. (iii) While the 3D culture format and the stretch imposed by bent PDMS posts improve morphological and functional aspects of maturation, the lack of true intercalated discs, spontaneous beating, and lower than normal adrenergic responses indicate that full cardiac maturation is not yet achieved with this protocol. (iv) PDMS has been shown to absorb different drugs to various extend19 and the actual effective concentration on the EHTs might vary. This bias might be more prominent in chronic toxicity studies15 than those investigating acute drug effects7,8 and clearly depends on the drug at hand. As a consequence, any PDMS rack exposed to drugs should be discarded after use and the potential absorption of different drugs will need to be taken into consideration when analyzing the data. (v) Given the fact that 1x106 hiPSCs are required per EHT the costs per data point are high. The significance of this protocol compared to ex vivo heart contractility analysis is the potential to work in a human system, the lack of experimental run-down, and the standardized production of EHTs which allows setting up large studies on specific genetic backgrounds (e.g. disease modeling). In comparison to other hiPSC test systems (multi electrode array, impedance), this system analyzes contractile force as the most important physiological parameter of cardiomyocytes in a three-dimensional structure and allows cultivation under defined load. EHTs contract regularly and at stable force, frequency and rhythm over many hours and weeks, allowing long-term measurements and evaluation of chronic toxicity. EHT analysis can be performed under electrical stimulation which is important with regards to the force-frequency relationship of muscle contraction and its potential influence on drug effects. With regard to the immature status of the hiPSC-CM, electrical stimulation has the potential to push the cells towards a more mature phenotype20,21 and could be included in EHT maintenance. In addition, the EHT test system provides high content readout including all standard histological parameters as well as biochemistry (RNA, DNA, protein isolation)11. Potential future applications include aspects of drug development (target validation, safety pharmacology) and disease modeling in particular in combination with CRISPR/Cas9 mediated generation of isogenic controls. During maintenance of EHTs and performance of concentration-response curves, it is important to carefully follow instructions for sterile cell culture procedures to avoid fungal contaminations during transfer of PDMS racks between 24-well plates. The most critical step with EHT though, is the cardiomyocyte differentiation protocol. For the EHTs to form coherently beating muscle strips, the input population has to consist of at least 60% cardiomyocytes. Fortunately, the differentiation protocols became more robust and efficient over the years and cardiomyocytes are readily commercially available by now. The role of non-myocytes in the development of hiPSC-derived engineered heart tissue is not fully understood, yet. Experiments with hiPSC-CM of high purity led to surprisingly good EHT7, but integration of other cell types into the tissue has been shown to improve tissue function and might push the phenotype towards a mature physiology22,23,24. As the tissues are generated in a 24-well-format with one million cells per tissue, this platform is still rather expensive. Scaling down to a 96-well format is aspired, but so far robustness outbalances this shortcoming. The protocol presented in this manuscript is technically very robust with little variability between the replicates. The intra-batch variability is very low for the kinetics (mean coefficient of variation = 5%), and somewhat large for the spontaneous beating frequency (mean coefficient of variation 10%) and contraction force (mean coefficient of variation 17%). The technique is very robust. Across different experimenters, the efficiency to generate beating EHTs is >90% of casted hydrogels. I.M., T.E. and A.H. are co-founders of EHT Technologies GmbH, Germany. The authors are grateful to Alessandra Moretti and Dennis Schade for their kind contribution of material. We acknowledge the great support of the iPS and EHT working group at the Department of Experimental Pharmacology and Toxicology of the UKE. The work of the authors is supported by grants from the DZHK (German Centre for Cardiovascular Research) and the German Ministry of Education and Research (BMBF), the German Research Foundation (DFG Es 88/12-1, HA 3423/5-1), British National Centre for the Replacement Refinement & Reduction of Animals in Research (NC3Rs CRACK-IT grant 35911-259146), the British Heart Foundation RM/13/30157, the European Research Council (Advanced Grant IndivuHeart), the German Heart Foundation and the Freie und Hansestadt Hamburg. Matrigel BD Biosciences 354234 For EHT reconsitutionmix. Laverty, H. How can we improve our understanding of cardiovascular safety liabilities to develop safer medicines? Br J Pharmacol. 163, (4), 675-693 (2011). Guidance for Industry S7B Nonclinical Evaluation of the Potential for Delayed Ventricular Repolarization (QT Interval Prolongation) by Human Pharmaceuticals. U.S. Department of Health and Human Services Food and Drug Administration. Available from: http://www.fda.gov/downloads/drugs/guidancecomplianceregulatoryinformation/guidances/ucm074963.pdf (2005). Burridge, P. W. Chemically defined generation of human cardiomyocytes. Nat Methods. 11, (8), 855-860 (2014). Kempf, H., Kropp, C., Olmer, R., Martin, U., Zweigerdt, R. Cardiac differentiation of human pluripotent stem cells in scalable suspension culture. Nat Protoc. 10, (9), 1345-1361 (2015). Yang, X., Pabon, L., Murry, C. E. Engineering adolescence: maturation of human pluripotent stem cell-derived cardiomyocytes. Circ Res. 114, (3), 511-523 (2014). Mannhardt, I. Human Engineered Heart Tissue: Analysis of Contractile Force. Stem Cell Reports. 7, (1), 29-42 (2016). Eder, A. 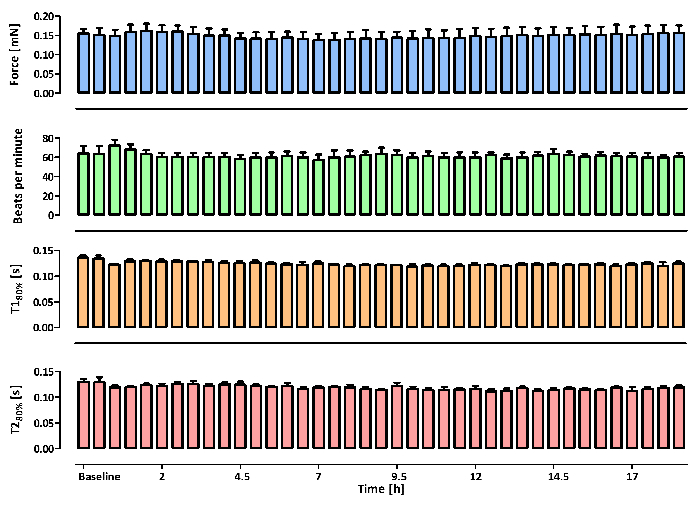 Effects of proarrhythmic drugs on relaxation time and beating pattern in rat engineered heart tissue. Bas Res Cardiol. 109, (6), 436 (2014). Stöhr, A. Contractile abnormalities and altered drug response in engineered heart tissue from Mybpc3-targeted knock-in mice. J Mol Cell Cardiol. 63, 189-198 (2013). Schaaf, S. Human Engineered Heart Tissue as a Versatile Tool in Basic Research and Preclinical Toxicology. PLoS One. 6, (10), e26397 (2011). Hansen, A. Development of a drug screening platform based on engineered heart tissue. Circ Res. 107, (1), 35-44 (2010). Frank, S., Zhang, M., Schöler, H. R., Greber, B. Small molecule-assisted, line-independent maintenance of human pluripotent stem cells in defined conditions. PloS One. 7, (7), e41958 (2012). Lanier, M. Wnt inhibition correlates with human embryonic stem cell cardiomyogenesis: A structure-activity relationship study based on inhibitors for the Wnt response. J Med Chem. 55, (2), 697-708 (2012). Hirt, M. N. Increased afterload induces pathological cardiac hypertrophy: a new in vitro model. Bas Res Cardiol. 107, (6), 307-323 (2012). Jacob, F. Analysis of Tyrosine Kinase Inhibitor-Mediated Decline in Contractile Force in Rat Engineered Heart Tissue. PLoS One. 11, (2), e0145937 (2016). Friedrich, F. W. Evidence for FHL1 as a novel disease gene for isolated hypertrophic cardiomyopathy. Hum Mol Genet. 21, (14), 3237-3254 (2012). Crocini, C. Impact of ANKRD1 mutations associated with hypertrophic cardiomyopathy on contraction parameters of engineered heart tissue. Bas Res Cardiol. 108, (3), 349 (2013). Fiedler, J. Development of Long Noncoding RNA-Based Strategies to Modulate Tissue Vascularization. J Am Coll Cardiol. 66, (18), 2005-2015 (2015). van Meer, B. J. Small molecule absorption by PDMS in the context of drug response bioassays. Biochem Biophysl Res Commun. (2016). Godier-Furnémont, A. F. G. Physiologic force-frequency response in engineered heart muscle by electromechanical stimulation. Biomaterials. 60, 82-91 (2015). Eng, G. Autonomous beating rate adaptation in human stem cell-derived cardiomyocytes. Nat Commun. 7, 10312 (2016). Huebsch, N. Miniaturized iPS-Cell-Derived Cardiac Muscles for Physiologically Relevant Drug Response Analyses. Sci Rep. 6, (24726), 1-12 (2016). Masumoto, H. The myocardial regenerative potential of three-dimensional engineered cardiac tissues composed of multiple human iPS cell-derived cardiovascular cell lineages. Sci Rep. 6, (29933), 1-10 (2016). Ravenscroft, S. M., Pointon, A., Williams, A. W., Cross, M. J., Sidaway, J. E. Cardiac Non-myocyte Cells Show Enhanced Pharmacological Function Suggestive of Contractile Maturity in Stem Cell Derived Cardiomyocyte Microtissues. Toxicol Sci. 152, (1), 99-112 (2016). Zhang, J. H., Chung, T. D. Y., Oldenbutg, K. R. A Simple Statistical Parameter for Use in Evaluation and Validation of High Throughput Screening Assays. J Biomol Screen. 4, (2), 67-73 (1999). Vandenburgh, H. Durg-screening platform based on the contractility of tissue-engineered muscle. Muscle Nerve. 37, (4), 438-447 (2008). EHT Technologies GmbH. Available from: http://www.eht-technologies.com Forthcoming.